I’ve been reading all things strawberry when it comes to recipes these days. 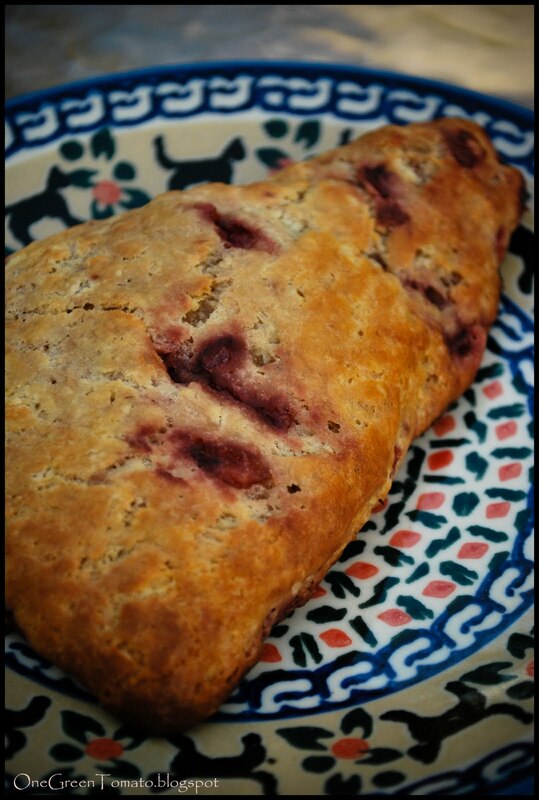 Several weeks ago I happened to stumble upon one for strawberry scones posted by Annie, of Annie’s Eats. I was a little apprehensive about freezing the dough, but as it turns out they’re just as tasty right out of the freezer as they are direct from the mixing bowl! In a small bowl whisk together egg, milk, yogurt and lemon zest; set aside. In a food processor mix flour, sugar, cream of tartar, baking soda and salt. Add butter and pulse several times so that butter is cut into flour. Transfer flour mixture to a large mixing bowl, add strawberries and toss to coat. Add wet ingredients to the mixing bowl and gently fold together until a sticky dough forms. Transfer dough onto a well floured surface and pat into a disk approximately 8″ in diameter. Using a pizza wheel cut dough into 8 triangles, wrap in plastic wrap and freeze or bake for 16 minutes at 425. Here is where I ran into trouble. My dough was STICKY, like turn the bowl upside down and it doesn’t move, sticky. When I made the first batch I followed the recipe (for the most part) and used 2 1/4 C flour. This was not enough, so when I transferred it onto my cutting board it just stuck to my hands. I coated the dough with more flour in hopes to get it to form into a workable state. No such luck. 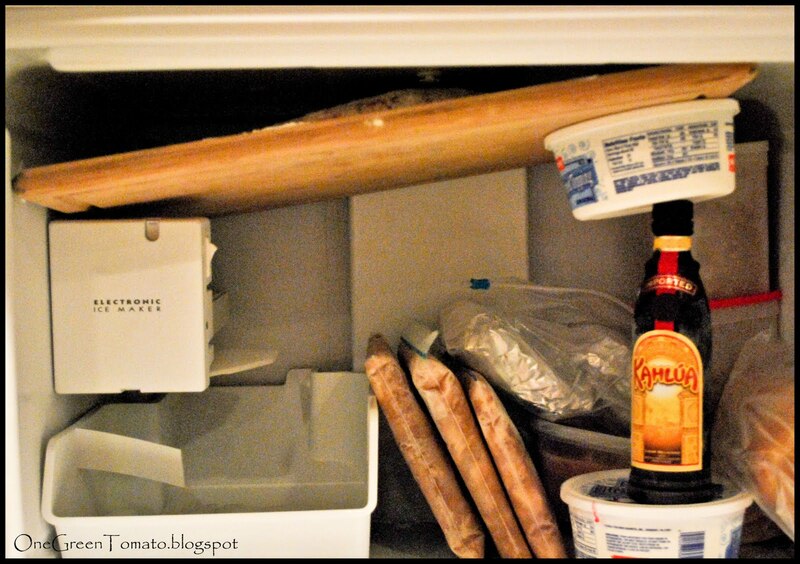 Solution, chill it in the freezer. Problem, my cutting board is quite large and my ice maker is in the way. Solution, creative stacking! Once my dough chilled, approximately 10 minutes, I was able to carefully remove it from the cutting board using my spatula and individually wrap each scone. At this point you can either freeze the individual servings or bake them to be consumed in the next hour or so. 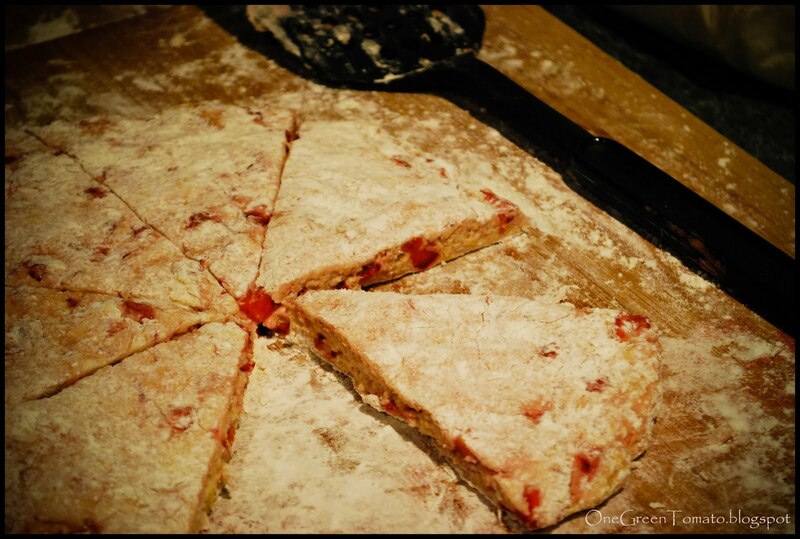 Due to the high amount of water in strawberries they tend to make your baked good soggy if left uneaten. Not that these tasty pastries will be hanging around your kitchen for long! If you plan on baking direct from the freezer add an additional 2-3 minutes to your bake time.